Oh Elvis, where art thou? Living on the Moon? Witness Protection? Kalamazoo? For more than 35 years Elvis lovers have been asking themselves this question, desperately wanting to believe their musical hero is still alive. Seeking to finally put the matter to rest, Xaviant Haze blows the Elvis conspiracies vault wide open with the first book dedicated solely to the mysteries surrounding the King of Rock n’ Roll. While giving an accurate and concise history of the King's life, he also illustrates how Elvis's talent was seized and controlled by the darker forces within the entertainment industry. The rise of an artist to celebrity status, his work while a mind control victim and his (or her) ultimate self-destruction has become an all-too-familiar story in pop culture, so frequently seen it can hardly be considered a coincidence. But Elvis was no manufactured Disney creation, he was a true one-of-a-kind talent rising from epic poverty to become one of the most iconic entertainers the world has ever seen. His was a tale of screaming fans, groundbreaking music, untold riches, dizzying fame and a spectacular free fall into obliteration. It was also a tale of UFO encounters, zany fake funerals, studies in metaphysics, numerology, occult theology—and a strange connection with Michael Jackson. An infamous pill addiction led the King to an early “death” and in the aftermath a pop culture phenomenon was born, enabling Elvis to sustain a famous afterlife thanks to over three decades of conspiracy theories. It’s time to reexamine these theories and put to rest once and for all the notion that Elvis could have faked his own death. If we can… The book includes the complete comic strip “Elvis Presley: His Story in Pictures” written by Angus Allan and illustrated by Arthur Ranson. First published in Look-in magazine, this marks the first time the strip has been republished in its entirety since 1982 and the first time it has ever been available outside of the United Kingdom. Contents include: The Man and the Myth; Heartbreak-on through Hotel; Elvis joins the Army (Monarch Butterfly); Pills and Cheeseburgers; Elvis Dies! ; Elvis Lives! ; Elvis versus the Mafia; Elvis the Esoteric; The Michael Jackson Connection; Long live the King; Elvis Presley: His Story in Pictures; more. Was $19.95, now only $14.95! 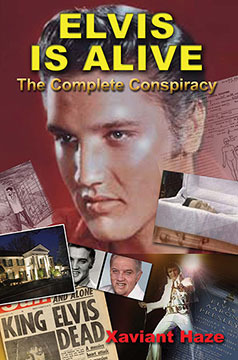 ELVIS IS ALIVE: The Complete Conspiracy By Xaviant Haze. 202 Pages. 6x9 Paperback. Illustrated. 8-page color section. References.